Why buy a Sherriff suit? In the mid-60’s Brian and Pat Sherriff took up beekeeping, in a small way at first, then establishing themselves as South Cornwall Honey Farm, commercial beekeepers running 400 hives in the extreme South West of England. Brian and Pat were specialist designers with years of manufacturing in the clothing industry formally having made Military Uniforms, lingerie, corsetry and swimwear for top International High Street stores like Marks and Spencer’s. Unhappy with the protective clothing and veils available at the time being cumbersome and having veiling which was hard to see through, Brian and Pat decided to use their designing expertise in creating their own head protection thus first pioneering the “Original” ‘No Hat Needed’ lightweight self-supporting hood with UV resistant veiling in 1968. Believing that beekeepers should look smart and realising that there was a real need for their hooded style of protection a range of premium quality, purpose made beekeepers apparel was created. Each BJ Sherriff creation incorporates our (1968) unique design twin-zip system allowing the hood to be thrown back to rest on shoulders until needed (ideal when driving from apiary to apiary) and equally importantly, the hood is detachable and interchangeable on most styles and can be separated from the body for easy laundering. Gradually over the years we have developed our range producing a style and a spectrum of bee friendly colour fabrics to suit every beekeeper. Sadly Pat Sherriff co-founder of the business passed away in 1994 and is sorely missed to this day. Brian Sherriff is still the Master Cutter and creative designer for the majority of the garments. We started exhibiting at Beekeepers Conventions and Honey Shows Internationally in the 1970’s and our daughter Angela Sherriff joined us on many of these trips and BJ Sherriff is now a father and daughter team Partnership. Often we meet beekeepers who show or tell us about their bee suits which they bought from us in the 1970’s and which are still going strong! 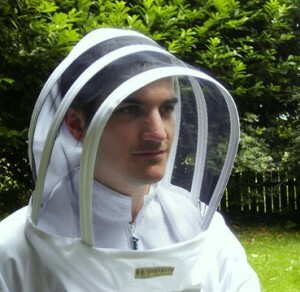 Sherriff’s beekeepers protective clothing with hooded veil is now the recognised protective apparel the world over – a distinctive style of clothing which has revolutionised the world of beekeeping. We also supply an extensive range of beekeeping essentials – accessories, equipment and gifts. We offer a tailor-made/ bespoke protective clothing service. Over the years’ BJ Sherriff’s quality and design has become legendary. As the inventor’s of the original detachable throw-back hood and veil, we continue to lead the way, revolutionising the world of beekeeping. We are proud of our heritage and passionate about what we do, which is why our BJ Sherriff range of clothing has been, and will continue to be made at our ‘Ranch’ here in England. View our Made in England page here. As former commercial honey farmers (starting business life as the South Cornwall Honey Farm), we know what matters most in beekeeping, but we never stop listening to what our customers’ want too. We pay attention to every last detail on every single garment, which is why our veils don’t crack – they are light, and airy having excellent visibility which makes or hoods extremely comfortable to wear and offering extremely good protection at the same time. Our suits and clothing last season after season – they are created to stand the test of time. Zips are robust and seams are strong. It’s not just what we aim to deliver; it’s what our customers’ tell us time and time again. View our testimonials here. Whether you have 1 or 20,000 beehives, you can be sure you are investing in the highest quality protective clothing, designed by beekeepers for beekeepers. Your safety is uppermost that’s why all BJ Sherriff products undergo stringent testing in apiaries at home and abroad before being launched on the market to give you every confidence whilst beekeeping. The legendary Long-Life S36.Apiarist All-in-One suit with integral hood – the STAR of all bee suits was developed with your overall protection in mind and comes with the recommendation of expert beekeepers working with the Africanised bee as well as gentler honey bees. We work closely with beekeepers the length and breadth of Britain and worldwide, to ensure every part of our BJ Sherriff range is the best it can be.